Copenhagen, Denmark – 17 January 2019. 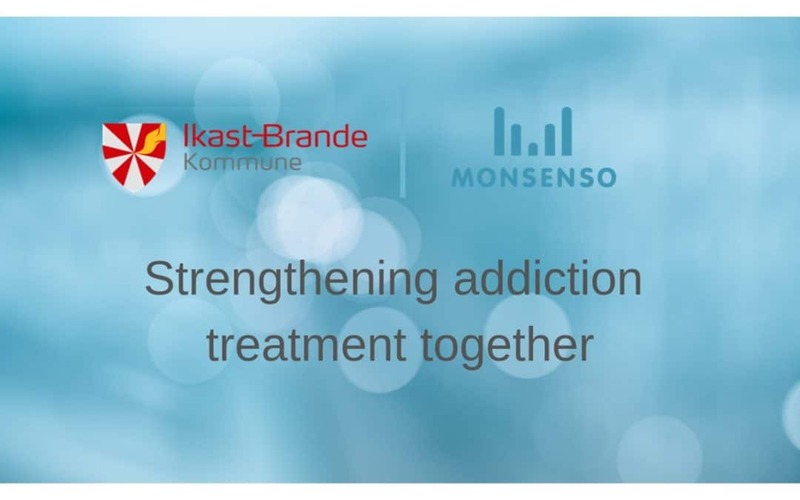 Monsenso, a Danish healthtech company focused on mobile health solutions for mental health, is proud to announce our newest collaboration with the Center for Rusmiddelbehandling in the municipality of Ikast-Brande. The aim of the pilot project is to examine how the Monsenso mhealth solution can be used as an integrated part of the addiction treatment, across both alcohol and substance misuse. The project, which will be running from January 2019 to January 2020, will primarily involve people in outpatient treatment. This is the first step in implementing the solution more broadly throughout the center’s services, widening the scope and population that they can reach, and ultimately benefitting the people living in the municipality. The aim of the project is to evaluate the clinical and financial benefits of using the Monsenso Solution. This is relevant for clients currently receiving treatment and for clients who have completed their treatment and are part of the post-treatment service, where it is crucial not to fall back into old and undesired habits. With the help of the Monsenso solution and the data that are being reported directly by the client, the clinician will be able to personalise the treatment to fit each client’s needs, as they have knowledge of the client’s issues over time. It also allows for clinicians to be more proactive and reach out to clients at the time they need help in order to avoid potential relapses. Mette Christensen, the Head of the Center for Rusmiddelbehandling, says: “We are implementing this new technology in our addiction services to improve the quality of the treatment we can provide. At the same time, we get to be more pro-active and understand our clients better, which will profit both them and the entire municipality. The clinicians are motivated to try a different working method, so we look forward to getting started”. Center for Rusmiddelbehandling (CFR) is Ikast-Brande municipality’s offer of counselling, treatment and prevention of alcohol and substance misuse. The center currently has 20 employees with different educational backgrounds, which provides a wide range of competences. CFR offers both outpatient alcohol and substance treatment, day treatment and substitution therapy. For more information visit www.cfr.ikast-brande.dk. Monsenso is an innovative technology company offering a mHealth solution that optimises the treatment of mental disorders. Our mission is to help individuals, carers, caregivers and researchers to overcome the burden of mental illness. The solution provides a detailed overview of an individual’s mental health through self-monitoring and collection of behavioural data and supports the individual by connecting them to carers and clinicians to facilitate self-care, informal and formal care. Our team is committed to developing extensive solutions that effortlessly fit into the lives of the individuals and support the treatment resulting in a better mental health. For more information visit www.monsenso.com.